Register your email for updates on Two Left Feet and other apps by this developer. 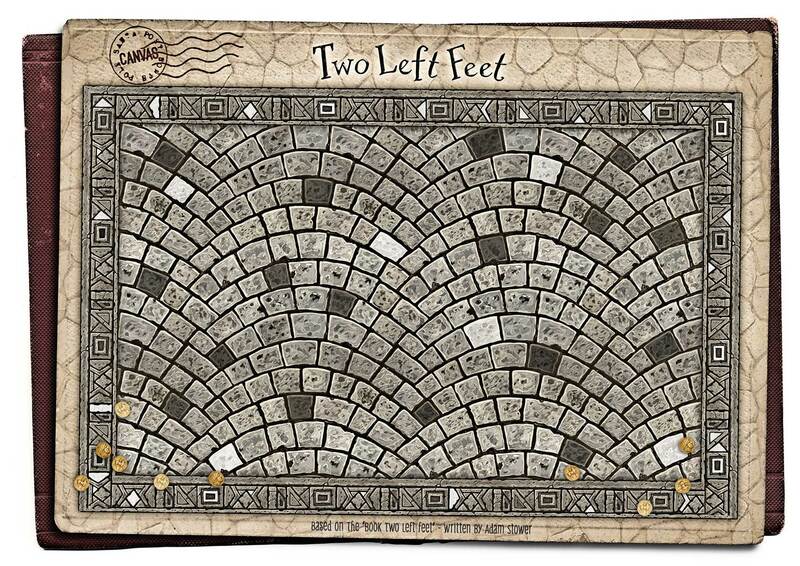 Two Left Feet wins at the Mobies "BEST NEW APP 2013"! Two Left Feet receives Editors Choice Award! ALEX KIDMAN, Gizmodo – "Resin Turns Two Left Feet Into Something Magical"
MICHELLE STARR, c|net – "Two Left Feet: an AR pop-up book for the digital age"
"I am very excited to see this new app breathe life into Rufus and his friends. I hope it will bring lots of extra enjoyment to fans of Two Left Feet, and introduce many new readers to Rufus too." 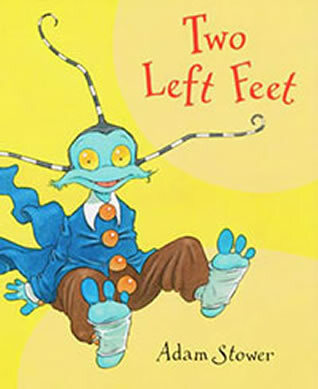 ADAM STOWER, Two Left Feet book author and illustrator. "We’ve seen quite a bit of Augmented Reality related to books, but we’ve not seen something quite as spectacular or as engaging as TWO LEFT FEET." Louise Sherwin-Stark, Managing Director. Bloomsbury Publishing. 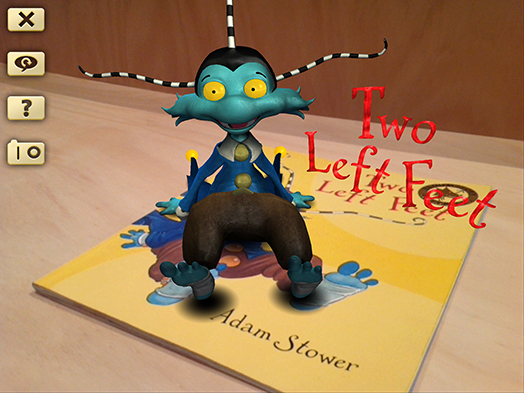 The app brings the book, Two Left Feet by acclaimed UK Author and Illustrator Adam Stower to life. Through the use of 3D augmented reality (AR) technology children can bring new life to the book or experience for the first time without the book. The story takes place in a fantasy world where monsters live, monsters who love to dance. The monsters live in a ‘dungeon world’ rooms carved into the cliffs of a mountain that atop is the Glittering Palace, home to the King and the location for the Grand Ball. Children will learn about how our differences are often the things that make us special through the lead character Rufus who loves to dance in spite of his Two Left Feet. We have a limited number of hardcover copies of the book, Two Left Feet on sale for $17.99 AUD this week (SALE EXTENDED! - MRRP of $27.99 AUD) plus shipping. If you would like to purchase one select the correct option below for purchases within Australia or the rest of the world. Please don't panic, from all the copies sold there has only been a couple of users who have had a problem running the app. This can be pinpointed to two conditions. If you are running an older version of the system you will need to update. The app works on any version of iOS6 and the new iOS7. If you are still running iOS5 it's time to update, sorry! The other is people using older iPad's. Two Left Feet requires as a minimum; iPad 3, iPad Mini, iPhone 4S (or iPod equivalent) or newer. Unfortunately the iPad 2 doesn't have the resources to run the 3D mode. If you do not own a copy of the book you will need to print a copy of the canvas to experience the app. This also comes with the app. Download and Print the CANVAS. Do I need the book? No. You can enjoy the 3D augmented reality experience either with or without the book. The app is designed to work for people who already own the book (you do not need a new copy) and people who do not own the book. I own the book, will the app work with my copy? Yes the app is designed to work with all copies of the book. There are no special codes for the technology to work, simply start the app and start exploring the pages to bring the book to life and hear the story narrated. I don't own the book. If you don't own the book you will need to print out a 'canvas' that will give the app what it needs to start. 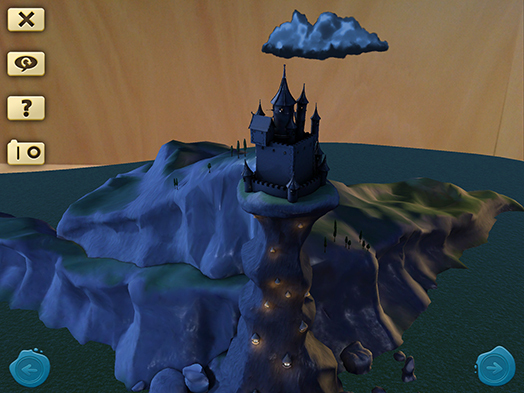 The story will then unfold narrated with a 3D augmented experience for your child. You may decide to buy the book later, but it is not required. Why should I get the book. 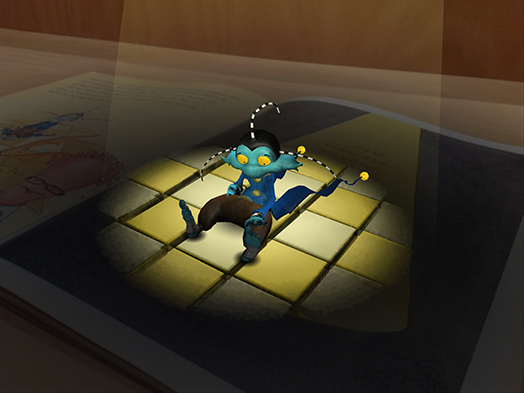 Whilst users without the book can experience the full narrated story and experience the 3D augmented reality animation. 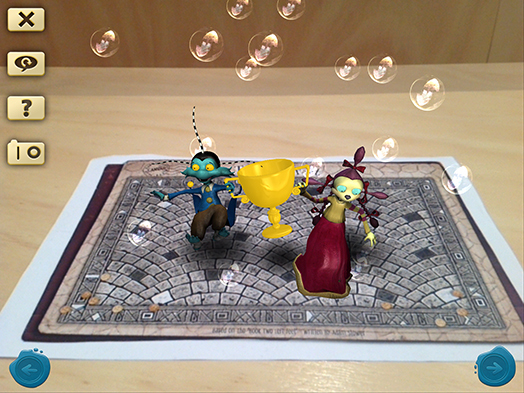 There are additional augmented reality experiences for the book owners. At this stage the app has been released for iOS. Once you've purchased the app from the Apple App Store you either need your copy of the book or to print out the 'canvas'. The app will use either of these to locate the surface and then your child can start exploring the world and listen to the narration of the story. note: Andriod release will be subject to the success of the iOS version. Will it work on my iPad, iPod or iPhone? Yes, if you are running iOS 6 or later the app will work. It should work on any device running this iOS, older devices may not perform as well as newer devices. It is also developed to take advantage of the retina display. The app has been tested successfully tested on iOS 7. The app allows you to take images and then share them using email and social media. Simply press the share button on the screen interface and select your preferred method of sharing or simply save to your photo library in the camera roll. The app was developed by Resin, an Australian animation and visual effects studio. 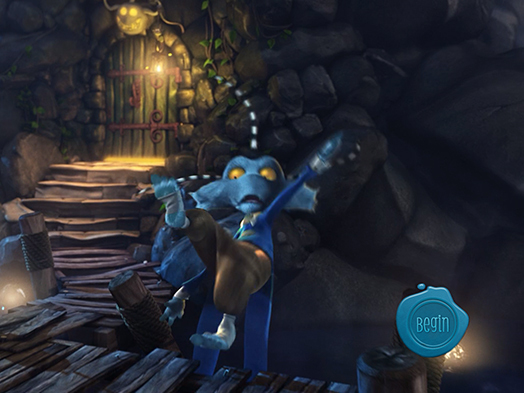 Resin is a boutique animation and visual effects studio. They have produced work for companies including Disney, Braun and EA and have worked on films including Where the Wild Things Are and Red Dog. One of the company owners had the book for his child and thought the story would translate wonderfully to animation and set about obtaining the rights with the publisher, Bloomsbury. The project was conceived and funded without any outside assistance and is the result of around 12 months development. "We have put a lot of love into this and we hope your children enjoy the experience and take something away from the story like I have when reading to my children." Grant Lovering, Creative Director, Resin. "What I love about this is it is bringing new life to something that people already own, love and are familiar with. If they own the book, they don't need to go out and buy another copy. As their children grow and become interested in playing with the iPad or iPod they can further explore the story and find new things each time. It's an amazing technology and project we are really proud of." Lincoln Wogan, Managing Director, Resin. Based on the book "Two Left Feet". Written by Adam Stower. © Adam Stower, published by Bloomsbury Publishing PLC. App developed and produced by Resin and uses the boooKAPP™ technology platform. boooKAPP and The modern day pop-up book are trademarks of Resin Pty Ltd.